SPARTANBURG, South Carolina — Sen. Ted Cruz (R-TX) argued here at a women’s forum hosted by Palladian View that President Barack Obama is waging a war on women. Cruz opened his speech with some familiar and some new jokes about how distant Washington, D.C., is from the rest of America. “I spent most of last month in Washington, D.C., so it is great to be back in America,” Cruz said when he took the stage, an infamous line he first coined when visiting Texas after the defund Obamacare battle in Washington about a year ago. “Tomorrow morning when we go to church, a lot of our pastors may start by going to the original root–looking to the etymology. If you look to the etymology of the word ‘politics,’ it has two parts. ‘Poli,’ meaning many, and ‘tics’ meaning blood-sucking parasites. That fairly accurately describes Washington, D.C.,” Cruz then said, a new joke. Cruz, who was joined here in the early presidential primary state at this event by his wife Heidi and 6-year-old daughter Caroline–their youngest daughter Catherine, who is 3 years old, was not with them here–also joked about how Caroline doesn’t like politics. In his speech, Cruz laid out the three women in his life who had the most impact on him as a person: his mother, his wife Heidi and his aunt Sonia–who like his father Rafael fled communism in Cuba for America after fighting against the rise of Fidel Castro’s regime. “What I want to do today is I want to talk about three women I admire, three women in my life who have had a real impact on my life,” Cruz said. Cruz’s father Rafael and his story have been prominent during Cruz’s rise to political superstardom since first getting elected to the U.S. Senate a couple years ago, but his aunt Sonia’s story, his wife’s story and his mother’s story have not–Cruz later told Breitbart News this was one of, if not the first time he’s ever brought Sonia’s story up in public. But each of the three women–his mother, his wife and his aunt–have their own compelling narratives that surround them, and their impact on Cruz as a senator and as a person. 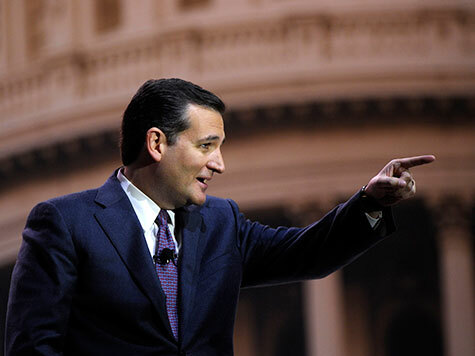 Cruz also told the audience that his parents actually split up when he was three years old–only to reunite after his father became an active Christian. Cruz then shifted into talking about his wife Heidi, who sat in the front row of the auditorium at the local community college while Cruz was on stage. Cruz noted how he and Heidi met while both working for George W. Bush’s presidential campaign in 2000–joking that means Bush is a uniter, not a divider. Cruz then shifted to his aunt Sonia’s story, which is very similar to his father Rafael’s–except she stayed in Cuba longer to fight Castro after he was in power. Cruz joked that Sonia is harder core than his father, who has gotten a reputation in conservative political circles for being one of the bravest leaders along with his son. Cruz said that because Sonia and the rest of his family have extended family in Cuba, occasionally his “Tia Sonia” goes back to Cuba to meet with them. He told a story of one person she met with when back there who cried as he praised her courage to get out of Cuba as Castro consolidated power, something this old friend of Sonia’s didn’t have the courage to do. Cruz said that because of his family’s impact on him, he fights for them on the national level. That all gets back to his larger point–about how Democrats and President Obama are hurting opportunity for Americans.